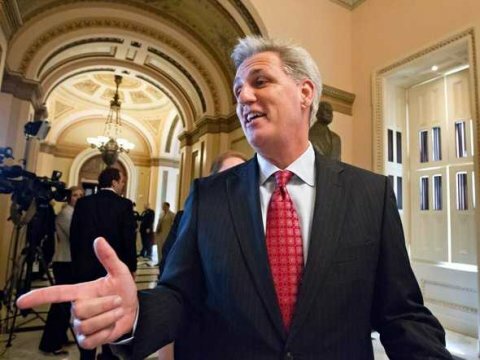 House Majority Leader Rep. Kevin McCarthy (R-Bakersfield) brings us up to date with this weekly report. passed this bill that excludes veterans from Obamacare’s punitive employer mandate threshold if they already have health care through TRICARE or the Department of Veterans Affairs (VA). For the sake of our veterans and all the small businesses who want to hire them, I am pleased that today this legislation was signed into law. "However, much work remains in changing the culture at the VA. Years after major problems at the Department of Veterans Affairs (VA) came to light; our veterans still aren’t getting the care they deserve. The VA continues to have a culture of unaccountability, and our veterans are suffering the consequences. To date, only three people have been successfully fired for manipulating wait times at the VA. Yet dozens of veterans, if not more, have died waiting for care and more continue to wait. This is unacceptable. "The problems in the VA aren’t caused by one or two or even three people. It is caused by a lack of accountability and a system of job security that protects employees even at the expense of the veterans they are supposed to serve. This bill to bring accountability to the VA is not about punishment. This is about putting our veterans, their health, their well-being, their choice, and their care above a job protection for a VA employee who would rather change the numbers and get a promotion than save lives. "We owe it to our veterans to send a message that their lives are more important than protecting the jobs of those who failed them. "In addition to our work helping our veterans, House passed this week H.R. 427, the Regulations from the Executive in Need of Scrutiny (REINS) Act that reins in the regulatory actions of federal agencies that place more and more burdens on our small businesses and entrepreneurs. "The Constitution demands a separation of powers between coequal branches of government. That separation has been blurred under the Obama Administration. The executive branch now acts as the legislator, administrator, and judge of regulations created and enforced by unelected bureaucrats. This is not only an affront to our constitutional order, it also blocks the people from having ultimate authority through their elected representatives over the laws that govern them and affect their lives. That means more costs get added on to workers, businesses, and communities across this country without them having any say. "With this bill, Congress is reasserting its role as the sole legislator and making government more accountable to the people. Unelected bureaucrats shouldn’t have unchecked power, especially if a regulation is going to significantly affect our economy.